An intriguing new method for treating sleep apnea is showing promise in the lab. The November issue of SLEEP contains a new study about stimulating the muscles in the throat to keep the airway from closing. The muscle stimulator resembles a pacemaker and is implanted in the skin beneath the chest. 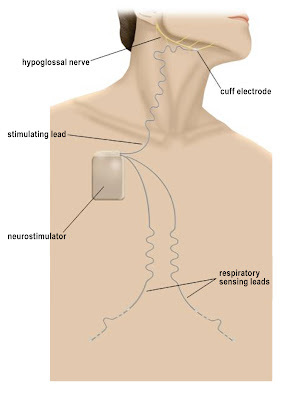 In Australia, the muscle stimulator was tested on 21 patients with sleep apnea. After six months, 19 of the patients showed significant improvements. They slept better and felt less tired in the morning. Unfortunately, the 20th patient needed the device removed due to an infection. Another muscle stimulator device was tested last summer at the Medical University of South Carolina (MUSC). As reported in July by the Sleep Education blog, the MUSC implantation was monitored as part of a trial by the Food and Drug Administration.